Shorts are comfortable. I’ve always been amazed at how much cooler I feel, even compared to light/linen pants, when I’ve changed into shorts. But, like all things comfort oriented, there is a time and a place for, as well as rules for appropriate use and accessorizing, your shorts. Shorts are inherently casual. There have been attempts lately to turn shorts into a fashion statement at formal events (see Pharrell at the 2014 Academy Awards,) but this is an exception left only to celebrity, and is still not immune from hesitation or outright mockery. But, the general rule for all of us is that even dressier or more expensive shorts are still reserved for semi-formal events at best- Think: company picnics, public golf courses, or on a sail boat. There are some (notably Tom Ford,) that insist that there are very few places that shorts are appropriate and that men should never wear them in the city. Naturally, this is a bit of a subtle slander to those who live outside of metropolitan areas- they must not have the culture of high-standards that urbanites do- but the truth is, that except in cases of extreme heat or discomfort or if the situation demands their use, there is probably a better option than shorts. Part of this certainty comes from a limit on the appropriate accoutrement for shorts. Right away you can eliminate socks, ties, and button-ups. A reticent reader could predictably raise an objection towards socks and button-ups, but let me clarify that we are talking about being fashionable- most aren’t terribly concerned about fashion when exercising, and so socks are acceptable while running or playing basketball, etc. The button-up just makes very little sense. During the anti-fashion counterculture of the 90’s Grunge era, flannels and long-sleeves of all kinds became a staple partner to tattered jean shorts and Doc Martens. Somehow, this remnant of anti-fashion still pops up. Now, long sleeves on their own is not necessarily a faux pas, but if there are buttons, a dramatic shift has occurred at your waist. It’s simply a fashion non-sequitur- your shorts say, “casual,” but your shirt demands business. It’s the mullet of clothing combinations. Some Long Sleeves make sense. 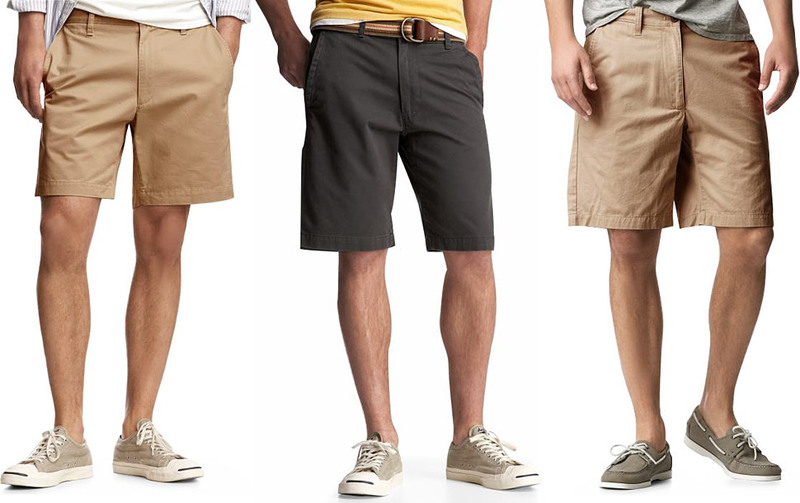 I’m not nearly as dismissive as some of the urban-fashion-elite, so I leave the choice down to a hierarchy of priority: if is a situation in which maximum comfort is desired or demanded- go with shorts. If it is a situation in which you want to look your best- forgo the leg-show. There is a vast grey area I’ve left here, and that is because prescriptive fashion leaves itself open to becoming outdated or obsolete. The edge of fashion is often populated by ventures into the unfashionable. So, in a year, this may all be wrong… For now, let’s hope that temperatures will soon reach the level where this discussion becomes relevant… it is Spring soon, right?  Archived in Mens Fashion and tagged men's fashion tips, mens fashion, Mens shorts, spring fashion trends. Bookmark the permalink.